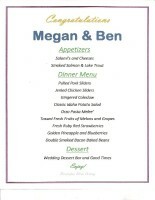 Here are some of our favorite menus to date! Remember that this is your menu, and if you want it, we can do it. We also do themed dinners such as potato bars, lasagna dinners, enchiladas, and taco bars. There are also many options for meats, sides, hot vegtables, soups, and salads.